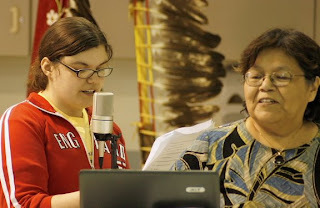 Photos by Brita Brookes: Third year linguistics student Autumn Mitchell reads a story in Ojibwe as her Professor Helen Roy looks on with approval. 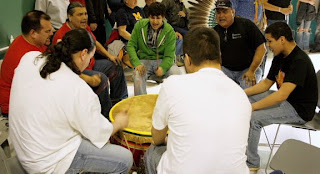 Ribbon Town Singers provided one of the three drums for the Pow Wow and concluded the Pow Wow with the AIM song. LANSING, Mich. -- On the rare sunny winter day while walking into the Ojibwe Language Weekend Pow Wow in Lansing, Michigan last weekend, one could hear the drums beckoning from the parking lot. Once in the building, one saw smiling faces and heard a loud and happy “Aanii!” In the Ojibwe language “Aanii” is “Hello.” At this event, there was sunshine inside as well as outside. The Pow Wow which was held at a local community center meeting room was done completely in the Ojibwe language. Third year Linguistics Student Autumn Mitchell read aloud two stories in Ojibwe while a projection screen on the wall projected artful illustrations of the storyline. Autumn has been a student of Helen Roy’s language teachings since Middle School. Autumn read two stories “When you Give a Mouse a Cookie” and my favorite “When you give a Mouse a Drumstick.” Already with extensive language training for her age, Autumn will be graduating in a year and a half and will be able to utilize her skills in continuing the legacy of promoting the language. 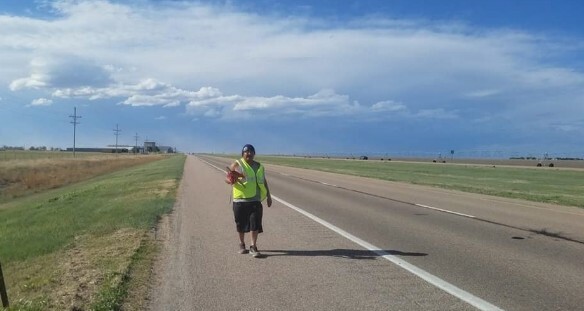 The loss of the Native Language can mainly be explained as a result of the oppressive and abusive nature of the Indian Boarding Schools which began in the 1870’s and continued on into the 1930’s and in some cases beyond. During the era of the Indian Boarding Schools, use of native language was forbidden and Indian students were severely punished if they spoke their language. The United States Government’s stance on the use of these harsh tactics was to create “assimilation through education.” Unfortunately, the majority of these educational facilities were latent with abuse and lack of respect for traditional culture. The wounds from the Indian Boarding Schools in the United States and Canada still remain today and explain why several generations of Native Americans do not speak their traditional language. The Learning the Language Pow Wow is evidence that the preservation and continuation of the language is being actively worked on in Michigan and being embraced by all generations of the community. Head Veteran and respected elder George Martin lead the room in a Blanket Dance for the three Drum Groups. During the Inter-tribal dances Head Woman Dancer Julie Whitepigeon and the Head Male Dancer lead the group while teenage shawl dancers, parents, elders, little babies, and curious visitors followed into the ever moving circle of colors and beauty. As they danced, Language Professor Helen Roy MC’d the activities in the language as the crowd of onlookers watched and listened carefully to the words. Many audience members tried to read along as the words appeared on the screen. The Pow Wow was free and open to the public. Like new spring flowers appearing in the snow, there was a large group of dancers who wore new regalia dresses and outfits which were carefully made over this long hard winter. To keep these flowers moving in time, there was presence of three drum groups including ‘Ribbon Town.’. The Pow Wow concluded with a Giveaway and a great rendition of “Splish, Splash I was Taking a Bath” on guitar and of course sung in the language by all, with some help from the experts! The Michigan State Pow Wow of Love will be occurring the weekend of February 21, 22 in hopes of continuing the momentum from this event. It was nice to see the students and community taking aim and shooting for their dream of reigniting the use of the language. See you next weekend! finally being able to speak there own language and for it being taught. Long live the Native American Legacy and their Culture! Who's That Nuking at My Door?